WALES boasts a village called Llanfair­pwllgwyn­gyllgo­gerychwyrn­drobwll­llanty­silio­gogogoch (58 letters), which in English means "Saint Mary's Church in the hollow of white hazel near a rapid whirlpool and the Church of Saint Tysilio near the red cave." The locals call it Llanfairpwll (pronounced thlan vire puth). We'll call it L56h. "The name of this world-famous station and village was created in the early 19th century by a local humourist," says the Tourists to Wales web site. "The station of Llanfair PG (the usual abbreviation) was the first on Anglesey, and opened in 1848. After a 20-year closure in 1973 to 1993, it re-opened in 1994 having been restored... During your visit you could also have lunch in the 'Sidings Restaurant.'" An English website, Go! 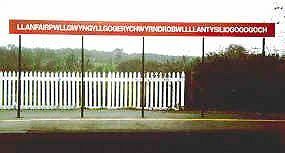 Britannia, says: "Thousands of visitors are attracted yearly to photograph its famous 15 foot long sign found on the railway station platform... (A little secret: as many double letters in English are regarded as single letters in Welsh, the name has only 51 letters)." Internet sites normally have a maximum of 28 letters but the rules were bent for L56h. Its website says the village was known until the 19th century as Llanfair Pwllgwyngyll – St Mary's church near the pool by the white hazels. To encourage train travellers to stop off, a cobbler suggested stretching the name. Local author John Williams believes that a tailor coined the tongue-twisting name to confuse the English. The website is at: http://llanfair­pwllgwyn­gyllgo­gerychwyrn­drobwll­llanty­silio­gogogoch.co.uk. NEW ZEALAND stakes its claim on the Maori name for a hill near Porangahau, Hawkes Bay, which is spelt with either 85 or 92 letters. Visitors climb the hill in four-wheel-drive vehicles. The Duke of Edinburgh Hotel invites them to buy a "Collectors' Longest Place Name Bottle of Hawkes Bay Chardonnay or Cab Merlot." The hill used to be called Taumata­whakatangihanga­koauau­o­tamatea­turipukaka ­pikimaunga ­horo­nuku­pokaiwhenua­kitana­tahu (85 letters). That's a combination of the words taumata (brow of a hill), whakatangihanga (music making), koauau (flute), o (of), tamatea (name of a famous chief), turi pukaka (bony knees), piki maunga (climbing a mountain), horo (slip), nuku (move), pokai whenua (widely travelled), ki (to), tana (his), tahu (beloved). Hawkes Bay Tourism's Internet site says that Porangahau in New Zealand's South Island, "boasts the longest place name in the world: Tetaumata­whakatangihanga­koaua­o­tamatea­urehaeaturipuka­pihimaunga­horo­nuku­pokaiwhenuaa­kitana­rahu, officially entered in the Guinness Book of Records." That stretches the name to 92 letters. 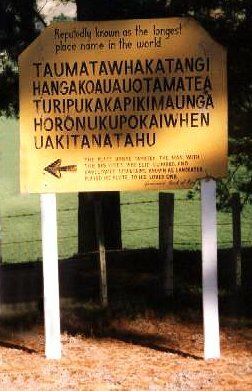 It says the name means "The place where Tamatea, the man with the big knees, who slid, climbed, and swallowed mountains, known as land eater, played his flute to his loved one." After ascending the hill, Gavin Kingsley, of Christchurch, in New Zealand's South Island, photographed a roadsign showing the name. The translation, he says, is "The brow of the hill where Tamatea, with the bony knees, who slid and climbed mountains, the great traveller, sat and played on the flute to his beloved." With a touch of cynicism, Gavin adds "Local history has it that the part about the knees and climbing mountains was added recently to make the name more interesting." Seeking on-the-spot information, we e-mailed Winton Hall, owner of Porangahau Lodge, who replied: "Yes, we do in fact have the Longest Place Name in the World at Porangahau. It is no joke. You can check it out in the Guinness Book of Records. "At the moment there is no real commercial use of the name but this could change in the near future. In the past I have run 4-Wheel Drive Safaris up to the summit of the hill but it has been fairly inaccessible. There is however new access proposed and the local iwi [Maori tribe] may turn it into a commercial attraction." THAILAND: "Bangkok is a city of extremes and superlatives, a city you do not react to indifferently," says Thailand at a Glance. "Recently declared the world's hottest city by the World Meteorological Organization, it also boasts the world's longest name: Krung-thep-maha-nakorn-boworn-ratana-kosin-mahintar-ayudhya-amaha-dilok-pop-nopa-ratana-rajthani-burirom-udom-rajniwes-mahasat-arn-amorn-pimarn-avatar-satit-sakattiya-visanukam. "Not surprisingly, only a handful of Thais can remember such a mouthful, although the abbreviated translation of the whole is a relatively brief Jewelled city of the god Indra. However, most Thais simply refer to it as Krung Thep, City Angels." We sought a ruling from a Bangkok wordsmith, Theppitak Karoonboonyanan who said the correct spelling (163 letters) is Krung­thep­maha­nakorn­amorn­ratana­kosin­mahintar­ayutthay­amaha­dilok­phop­noppa­ratrajathani­burirom­udom­rajaniwes­mahasat­harn­amorn­phimarn­avatarn­sathit­sakkattiya­visanukamprasit. given by Indra and created by the god of crafting (Visnukarma). "It's a kind of honoring or celebrating in (royal) Thai culture to name long (I couldn't confirm this in terms of historical background, though)," Theppitak said. "King Rama 1, the founder of the city himself, was named yet longer than the name of the city, in his ascending to the throne. Our King Rama 9 (King Bhumipol) also has a long name of a hundred letters. "The name of the city was given by King Rama 1, the founder of the city, to celebrate the new capital, 219 years ago, after Sukhothai, Ayudhaya, and Thonburi. He moved the capital of the country from Thonburi to a place called Bangkok at that time, and named the new capital as rungthepmahanakhorn. The name has been changed a little by King Rama 4 (King Mongkut) which has been used until now. "The name Bangkok is still used in international context because it was more familiar to foreigners in the past. In Thai, the city is called Krungthep in short, and is written with an abbreviation sign after it. "It may be pronounced as Krungthepmahanakorn in some formal occasions. But when we refer to the full name, it's the one with hundreds of letters as mentioned. If you want to get some formal evidence of the name, you may have to ask some governmental offices, or the Royal Palace. The old name Bangkok is only used in foreign languages, or it becomes informal in Thai." Third longest place name (bronze medal): WALES. Second longest (silver medal): NEW ZEALAND. FOOTNOTE: LA, North America's second largest city, undoubtedly has [almost] the world's shortest place name. But a settlement established there in 1781 was known as El Pueblo de Nuestra Senora la Reina de los Angeles de Porciúncula (The Town of Our Lady the Queen of Angels of the Little Portion). Its official name was El Pueblo de la Reina de Los Angeles. If LA went back to using its 55-letter earliest title, it would be a close fourth for the world's LONGEST place name!